Teganan Village near Candidasa in the east Bali is famous for the village where native Balinese “Bali Aga” is living. Old fashion Bali Hinduism people are living and always wear Balinese ethnic clothes. 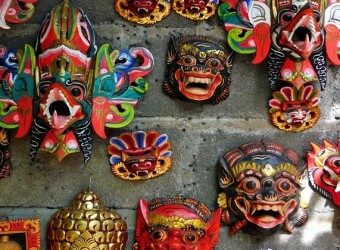 The culture of Teganan is different comparing with other Bali Hinduism. Men are farming and women are making Ikat and Ata products. Original Balinese village. A Bali Aga Village which has unique religion and customs. I was able to glimpse life of the villagers as well. This village is famous for its ata crafts and weaving ikat. It is a great traditional village.